Gimbel hits another, more routine shot at the course in Prescott, Ariz.
Statistically, forget about it. No one knows the odds of hitting a hole-in-one on a par-4, a single-swing feat that has been recorded just one time in the history of the PGA Tour, in 2001. 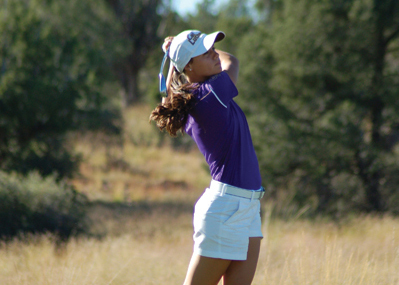 On Sept. 29 at the Embry-Riddle Invitational in Prescott, Ariz., when junior transfer student Jenna Gimbel smacked the first hole-in-one in CLU history, she put herself not two shots under par, but three shots to the good. To get a sense of how often it happens, well, again, we don’t know. Just picture a hurricane passing through Hertford, Hereford and Hampshire all in one day.